Further proof that I'm a crazy cat lady, as if you needed more! I should be learning my lines for the New Year's Eve show this Sunday with Austin Murder Mystery Players, but I'm procrastinating. It rained for three days straight here in Austin, which is a rare occurrence. The weather finally dried up yesterday enough to take the kitties outside for a good romp around. Marigold looks into her magic ball to tell your future. She says, "Yes, I see that there has been joy and pain, sunshine and rain." Oh Miss Mare, you are so wise! Kenji grows to super-huge size and knocks down a tree! Almost as amazing as the presence of grass in our yard! Sonic explores ancient ruins. Is that a Mayan temple? No, just the old stairs up to the back door under the lovely, new deck. We had a nice Christmas. I was busy visiting other people's furry babies while they travel. Chad played "house husband" and kept a steady supply of yummy food and clean house ready for my breaks. It's so nice when the tables turn, and I work while he does all things domestic! Yesterday, I was a whirling dervish of domestic duty! I cleaned, scrubbed, washed and tidied until my feet and my back cried "Uncle." The cats LOVE when I'm doing projects. They like to watch me running around the house. Kenji even helped me put fresh sheets on the bed. Mostly, they just supervise. They are my little furry sugarplums that bring me comfort and joy. I did NOT send out Christmas cards to my full list of friends and family this year. (Gasp!) As one friend put it, "do you think they'll even notice?" Forgive me if you noticed. We put up the super kitschy Christmas tree on Friday night. Pre-lit is the way to go, my friends! The cats were especially excited by this latest home decor project. I've made liberal use of the squirter to dissuade them from ingesting too much tinsel. Chad made like Santa Claus a few weeks ago and climbed atop our roof. Finding no chimney to slide down, he strung lights along the roofline instead. Sweet Kenji had enough holiday excitement, and climbed into her shopping bag cubby. "Bah humbug. Wake me after New Year's," she seemed to say. Cute to the 3rd Power! I'm going to retain this blog title and address, but now that most of the house projects are done, this blog will have more sappy weekly reflections and photos to share. If you're looking for the "before and after" house pics, see the September 2006 archives. On to the cuteness! I went to see my family this weekend. I took lots of pictures, and had a difficult time choosing the best ones to share. My niece, Mary, age 3, member of Future Heartbreakers of America, picked up lots of ladybugs and tried very hard not to squish them. Mary and my mom, a.k.a. MeMommy. Yes, her "grandma" nickname sounds like a rapper's name. Mary with her lovely red locks and me with my new dark hair. I love my dark hair. My super stylist, Monica, at Maximum FX salon rocks! Charlie, age 10 months, in his holiday suit! Love that hat! He looks like a little elf who escaped from Santa's Workshop at the North Pole. Christoper, age 6, with Mary and Charlie. I had more pictures of Mister Christopher, but he's in constant motion, and they're all blurred beyond recognition. I'm happy to report that my mom is doing well under the circumstances. I'm very proud of her. She's learning how to operate the computer, check her email, and how to manage accounts online. Keep her in your prayers and send her happy thoughts. my hunky, sweet husband, Chad. 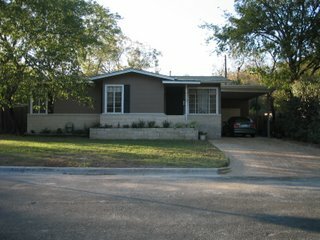 my cozy house and the completion of immediate house projects. reconnecting with old friends - like Kristen M. who had us over for an amazing Thanksgiving potluck dinner. new friends - who are fun, and a source of comfort and support. my three, cute funny cats. the past two years working as a Furry Godmother pet sitter. I've met so many wonderful pets and people. I've also had a peek at how other people decorate and arrange their houses, which sparked many ideas for my own house. 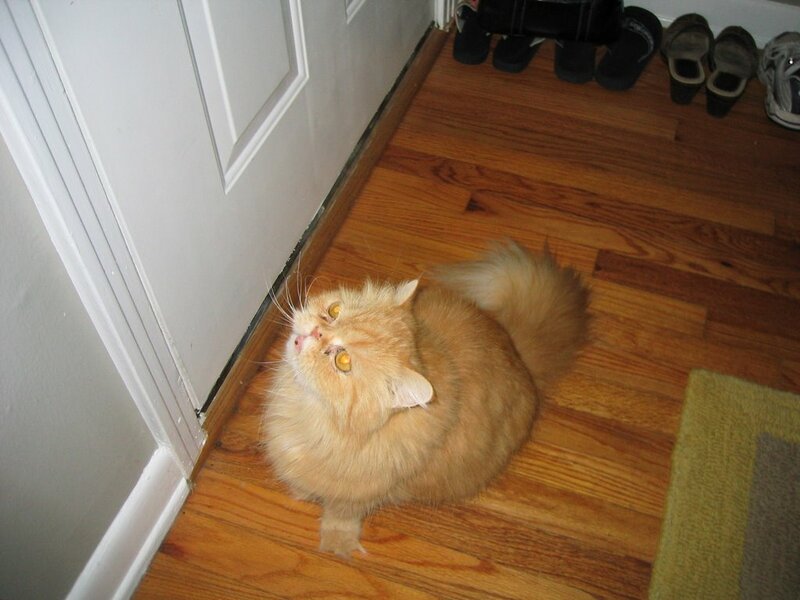 holidays off from working in 2007 as I part ways very amicably with Furry Godmothers. time off from working starting in January to be with my mom and my sister and her family. I miss my dad. I know that they do too. the prospect of new adventures. Losing my dad last month reminds me that I must actively seek to make the most of every day. 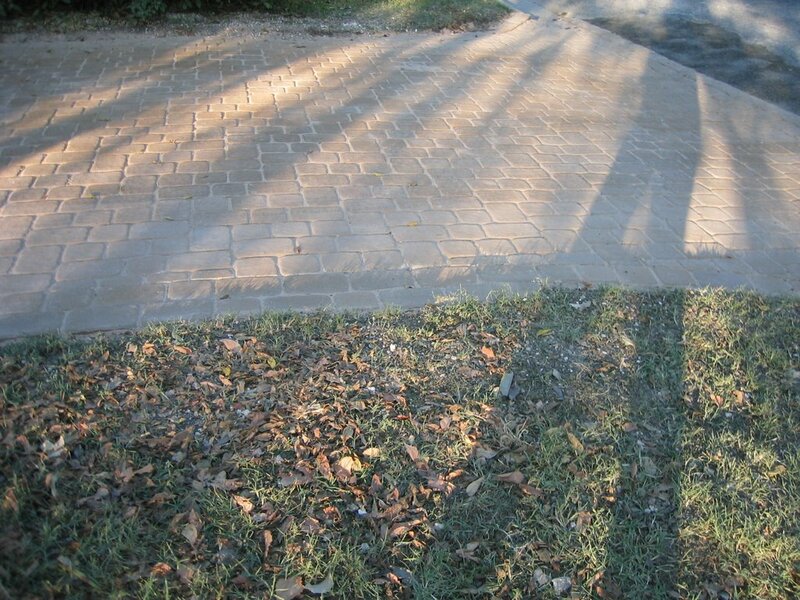 Driveway's Done, Time to Party! The interlocking pavers driveway and walkway were completed on Friday morning, November 17! The old driveway was a sad mix of sand and pebbles that sat three inches lower than the concrete carport pad. The old walkway resembled a jigsaw puzzle, not too safe for actual walking as the puzzle pieces shifted precariously with each step. After: So pretty. So functional. 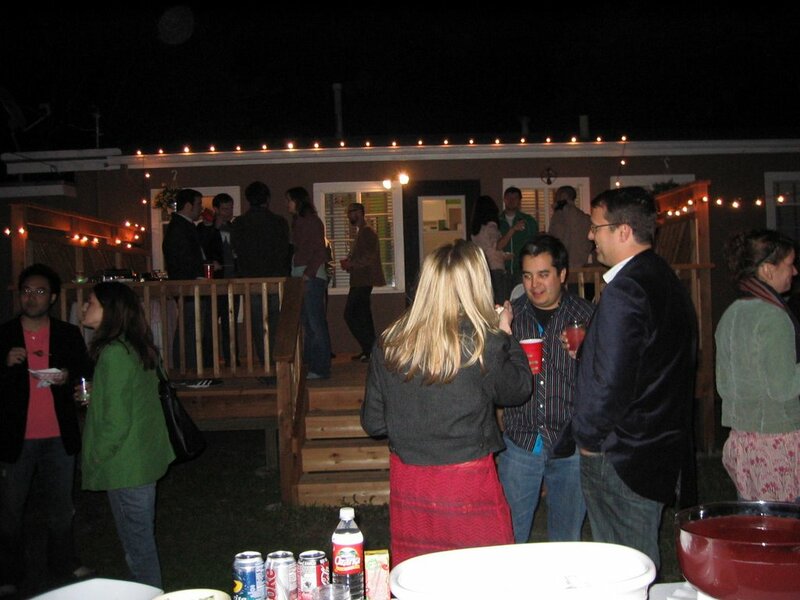 On Saturday, November 18, we had our big housewarming party. We wanted it to be six months after we bought the house. 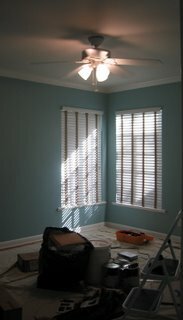 Our theory was that having the party would force us to finish painting and updating the house. The timing worked out pretty well. 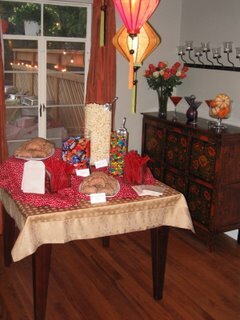 The "candy bar" featured kettle corn, M&Ms, twizzlers, fried apple pies and packaged candy bars. It was a hit! We sent fried pies home with lots of people. Mmm... pie makes a delicious but not very nutritious breakfast for the day after a party. 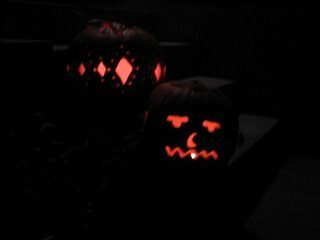 We went with a fall carnival theme. 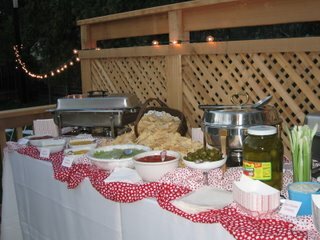 We had pickles, corn dogs with fancy mustards (yes, I loathe corn dogs, but our guests loved them), nacho fixings, boneless buffalo wings with celery and blue cheese on the buffet spread on the deck. 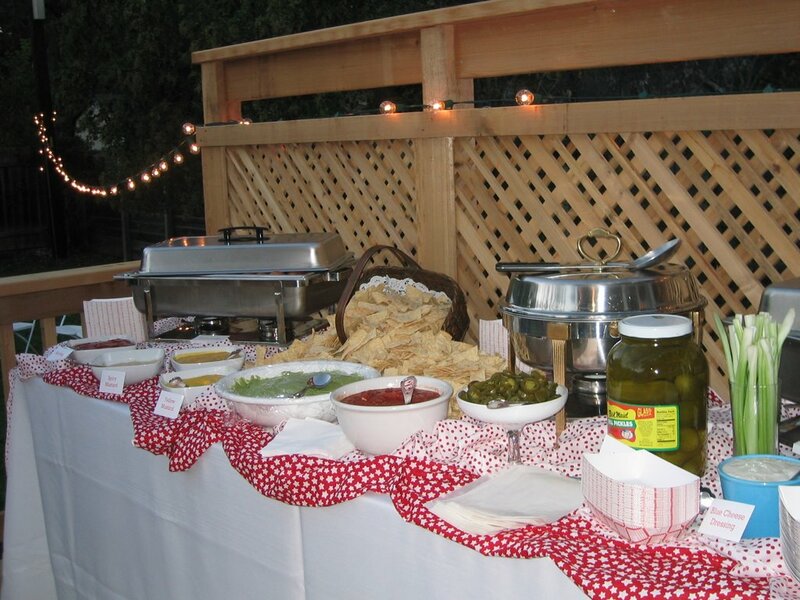 As one friend put it, "the food was spectacular. It was like going to the fair without smelling livestock and worrying about your car getting vandalized." Chad made funny signs for various doors. 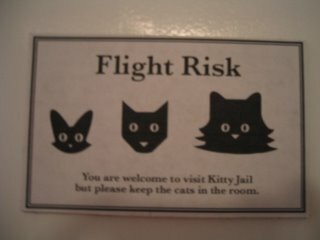 This was the sign for the kitty jail / guest room. 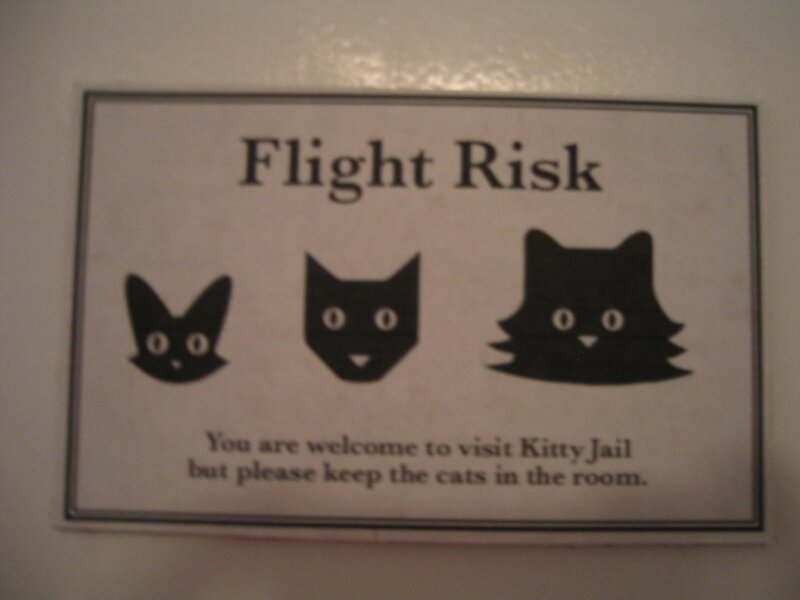 The kitty jail. If you look closely, you can see furry lumps: Marigold and Kenji on either side of the bed & Sonic on the chair. 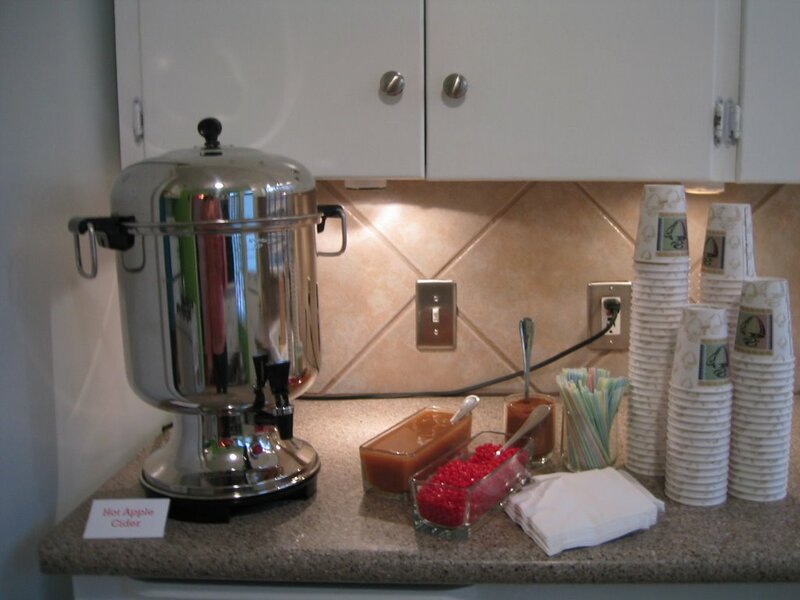 Hot cider with caramel, red hots & cinnamon to mix in. Yum! The idea for hot cider came to me during a manic, Martha Stewart-like episode at the HEB grocery store. I almost made little caramel apple wedges with nuts as garnish for the punch, but I called Chad and told him I needed him to talk me down. Thus no caramel apple wedges with nuts, but I did keep (what's left of) my sanity. Proof that we have friends. It was so much fun. We have lots of soda, juice boxes and cider leftover to get us through the year! We managed to give away the leftover corndogs luckily. I'm so happy that all of our immediate house projects are done! 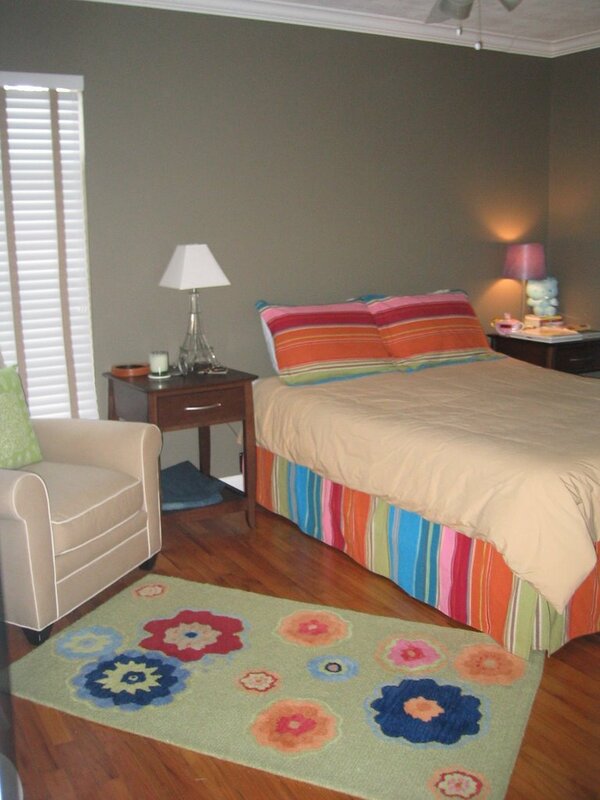 I look forward to some serious lounging in our cozy, cute house. 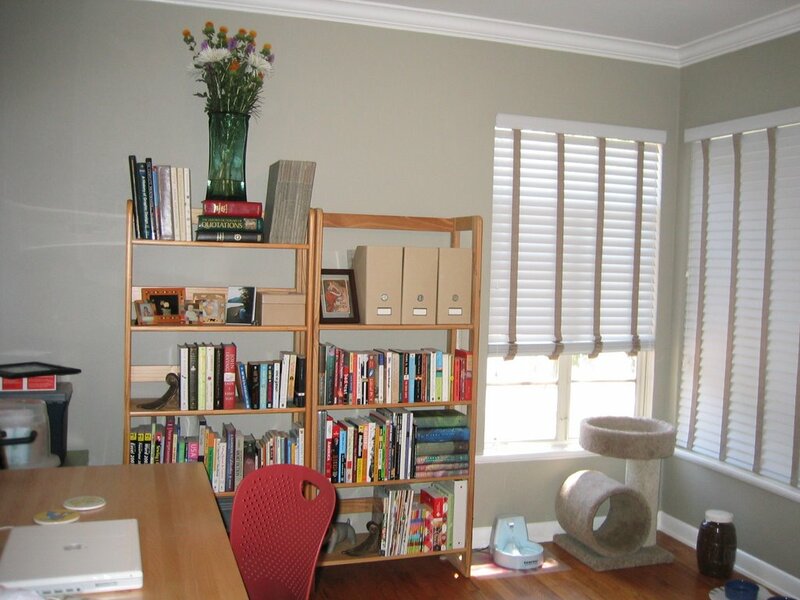 Ceilings & Pavers & Cats, Oh My! The interlocking paver stones arrived for our new driveway and walkway. Hopefully that project will be done by this weekend in time for the big housewarming party! Our kitties love to snuggle. Marigold is at the head of the bed with me, Sonic is in the middle-left and Kenji is at the foot of the bed. The newest feline family member, Sonic, was supposed to be a foster kitty. Of course, Chad & I are smitten with the kitten and are keeping him, rather than adopting him out to someone else. Yes, yes, everyone knew that would happen! 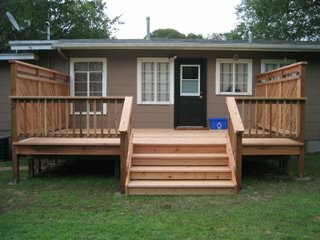 We have a deck! It only took the pros two days to build it. Love it! Love the privacy screen on both sides too. 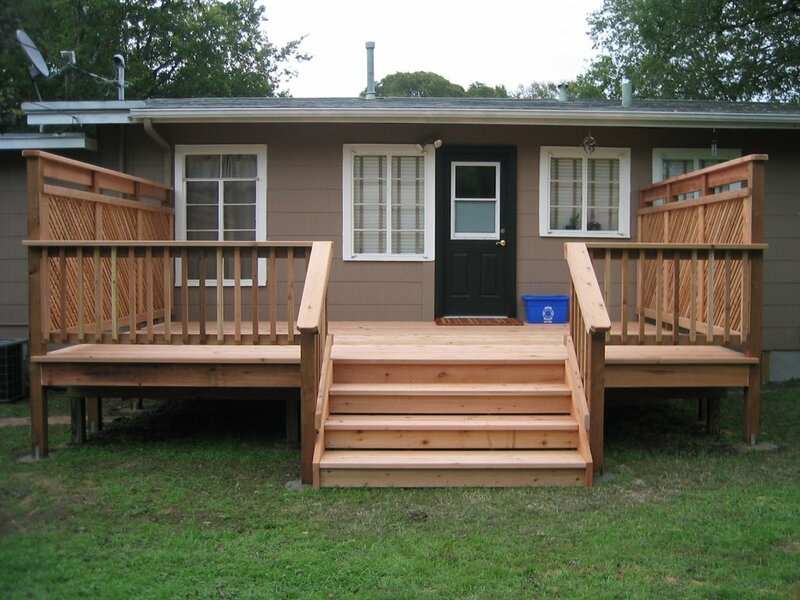 Add "buy deck furniture" to the to-do list. We finally have a bed in our bedroom! It is wonderful. Chad and I both love it. 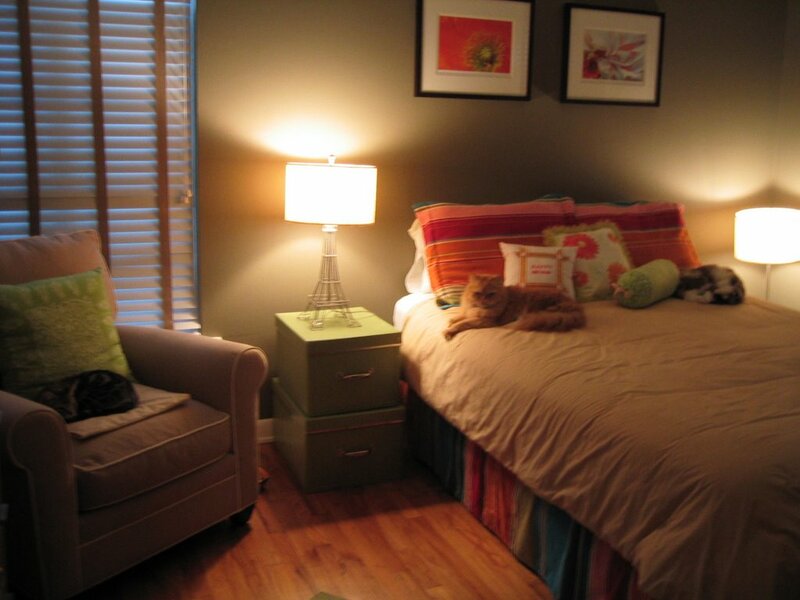 There is plenty of room for our insistently cuddly kitties too. We found another distributor of the Java collection who could special order that lovely but modern sleigh bed (previously mentioned) for us, but it would have taken four months (gasp!) to arrive. So we threw that plan out, and found this simple bed, appropriately named The Simple Bed that was in stock at a local furniture store. 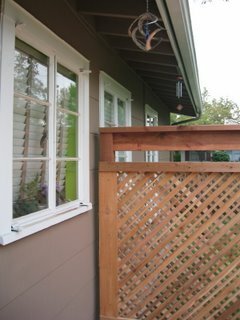 The existing, temperamental sliding closet doors were not very fashionable or functional, so we threw them out in the yard. Really, the old doors are in the back yard. 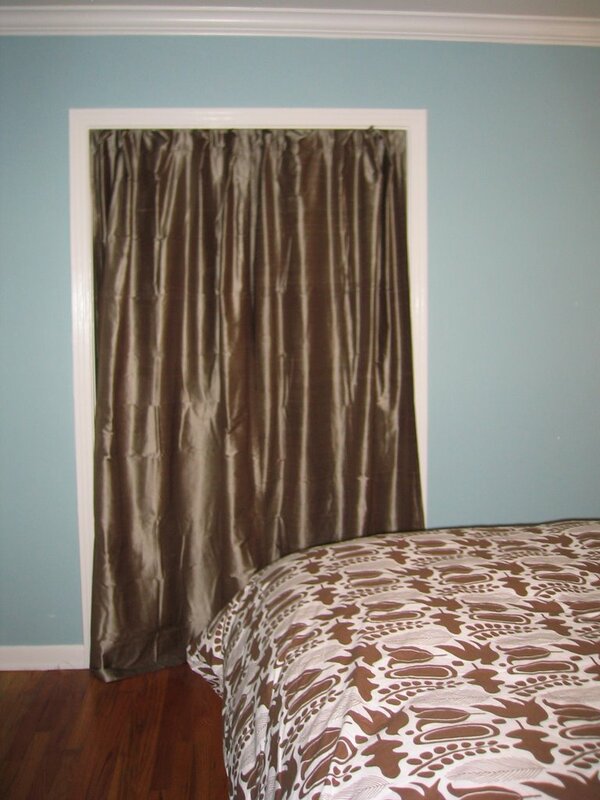 I picked these pretty drapery panels with a sturdy tension rod as the new closet-hider. Here are some gratuitous shots of our jack-o-lanterns. 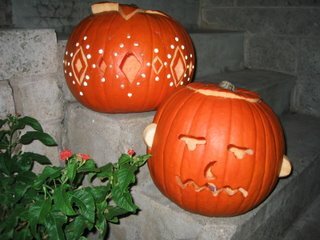 Chad's is a Charlie Brown head as an homage to The Great Pumpkin. 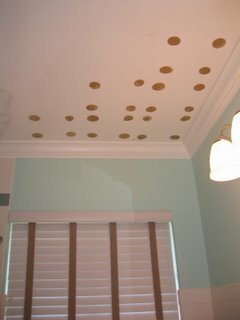 My design features argyles inset with sparkly marbles, reminiscent of my days as a prep-style-pusher at J.Crew. My dad passed away suddenly last week at age 58 while exercising on his treadmill. We think he died instantly of either a heart attack or a stroke. My chest literally aches with sadness right now. I'm very fortunate that my dad came to town and got to see our house last May when Chad & I bought it. My dad kept up with this blog over the past month and praised our progress, and laughed at our foibles. I'm happy that I got to share the experience with him even though he was halfway across the country. My parents have owned MANY homes over the course of their marriage. (Does anyone know of a good twelve step group to overcome real estate addiction? If so, please let me know so I can find a chapter for my mom to attend.) 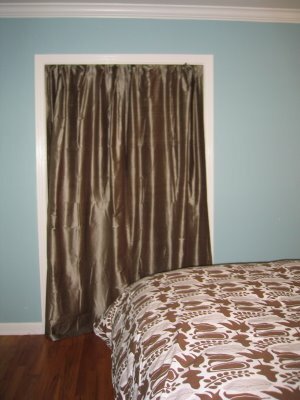 Dad and Mom worked very hard to make each and every home a showplace. 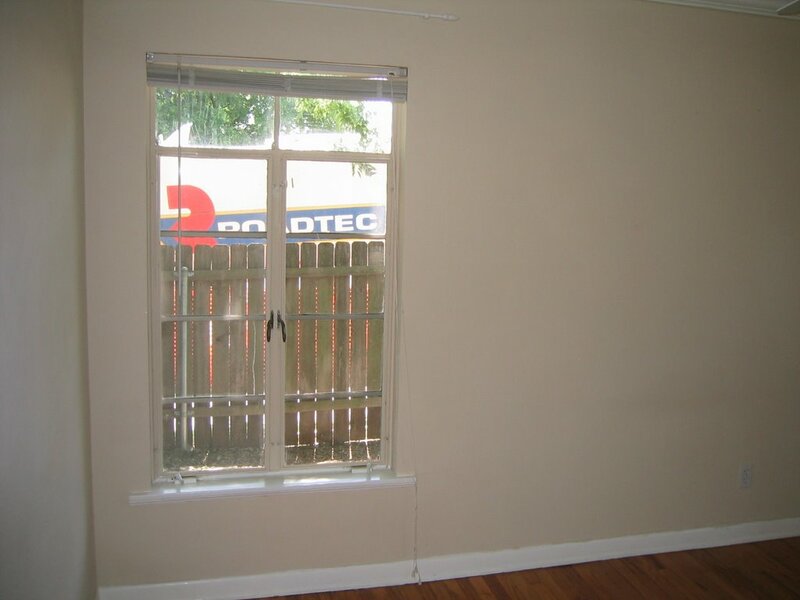 Even homes that we lived in for less than two years got lots of beautifying updates. 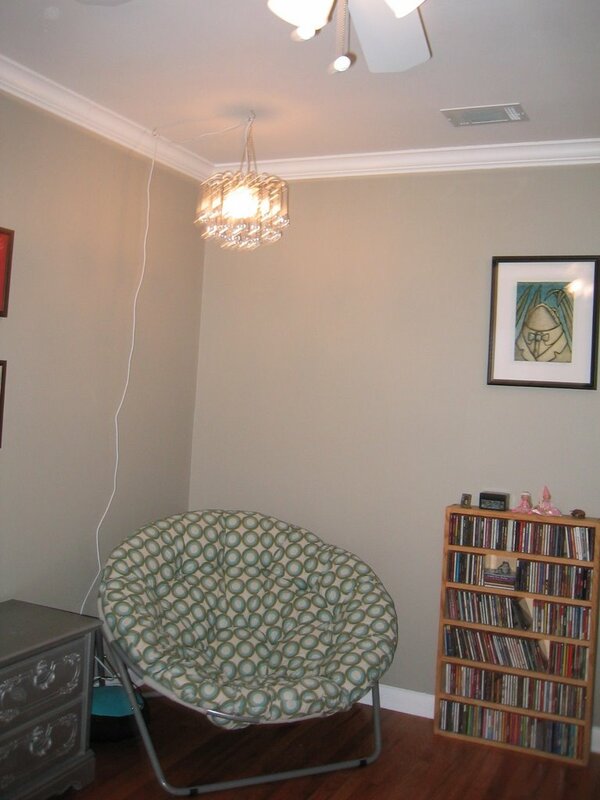 My dad enlisted my help to rip out wallpaper, hang wallpaper and to hold the light while he crawled around working on projects in dark cabinets and corners. Ripping out and replacing wallpaper with Dad convinced me that no home of mine will ever be cursed, blighted or otherwise besmirched by the presence of wallpaper. I don't care how many magazines say it's back in style, no way! I was very happy when Black & Decker came out with the adjustable snake-light, and I snapped one up to give my dad as a Christmas gift. I didn't have to hold lights anymore! I much preferred to hand Dad tools than to hold the light at just the right angle for what seemed like hours until my little arms shook with muscle fatigue. Maybe I'm being overly dramatic. 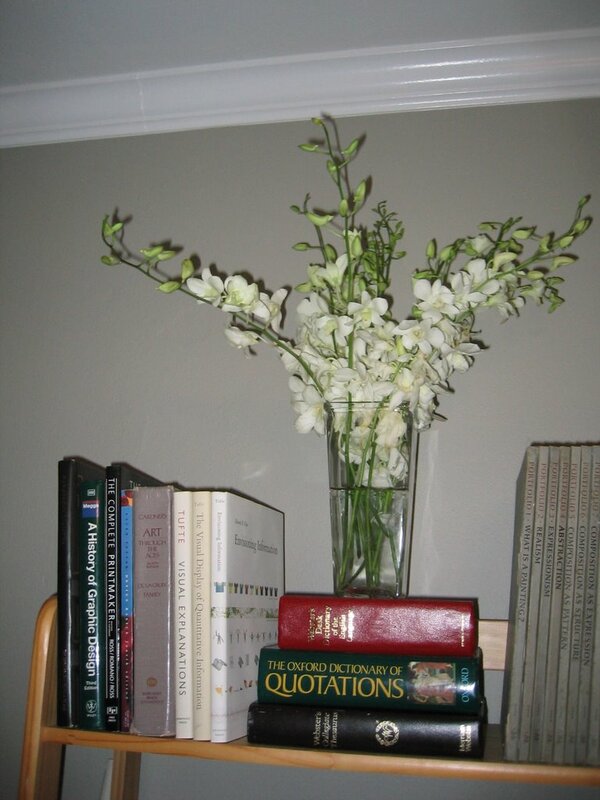 A friend of mine and Chad's sent these gorgeous orchids when she heard about my dad's passing. Many friends have reached out in support, and I very much appreciate each and every email, call, card or kind thought. Every home needs a gnome. We hope he does not roam! 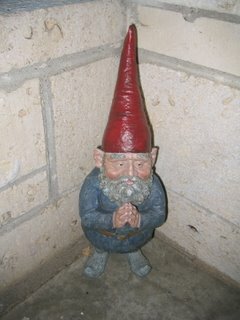 Chad calls him Gnomaste, because he looks like he's doing prayer position and wishing us peace. 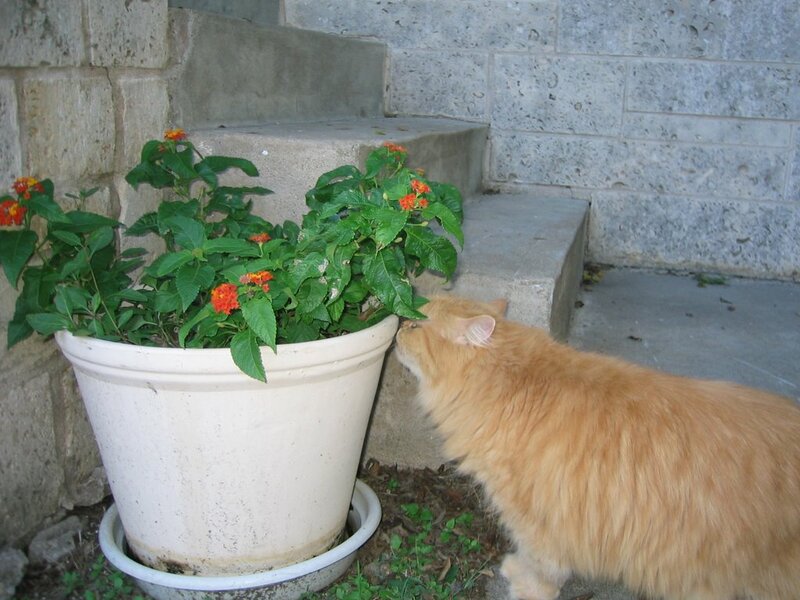 Marigold takes time each day to stop and smell the flowers. 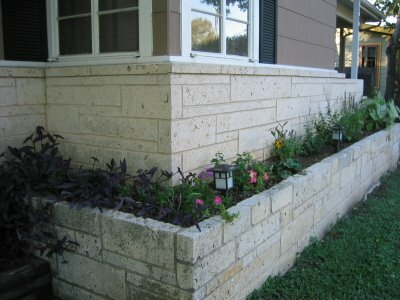 The front planter likes all the rain we've been getting. Our beautiful new underpinning courtesy of Ron from Aaron's Stucco. 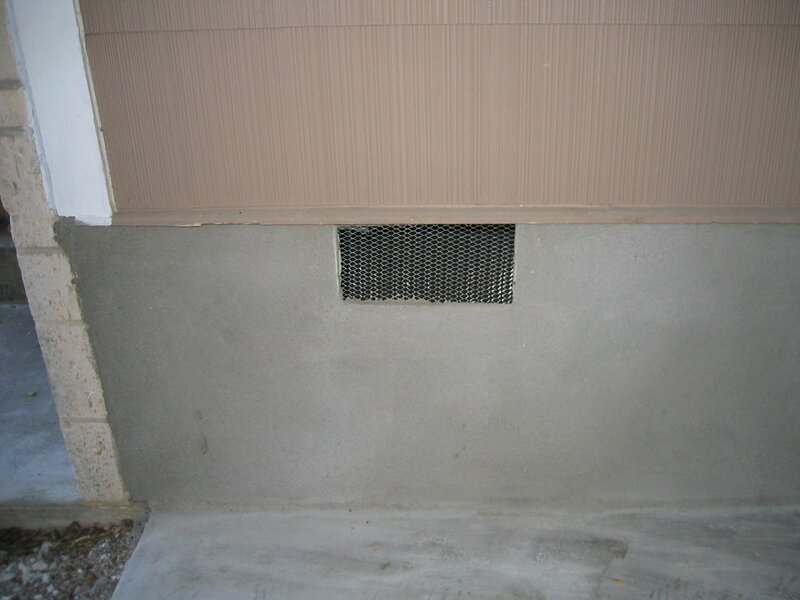 Ron did a great job and cleaned up his mess -- a total gem of a contractor! 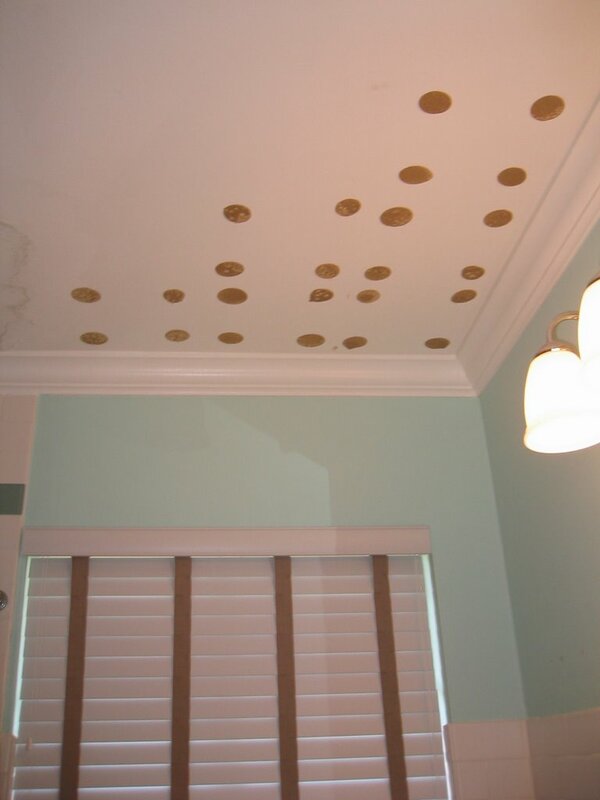 HGTV's website reported that installing faux tin tile ceilings was easy. Just lay out your grid carefully and starting in one corner, glue the tongue and groove tiles up to the existing ceiling. Chad made a fancy computer model of the grid for our tiles. He had about six of the 12 inch by 12 inch tiles up on the ceiling Sunday. It was looking great. I thought, "Wow! He'll finish this room today and maybe even start on the next room." Then I heard a crash, followed by a second crash and the sound of the lid of my favorite, big votive candle clattering on the cold, tile bathroom floor. The tiles fell, taking a wall shelf and its contents with them. Chad walked calmly into the bedroom and took a nap. I've scheduled the handyman. Stupid HGTV. Our bed that was on backorder, the Java bed, which matches all of our Java bedroom furniture, is in Houston in a warehouse. 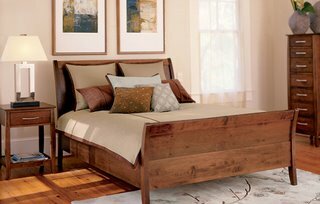 Storehouse, my favorite furniture store and main distributor of the Java collection, has filed for Chapter 11 bankruptcy. Storehouse was just bought by a liquidator who plans to close the chain of stores and sell off all assets. Yep, you guessed it, our bed happens to be one of those assets. (Cue the silly sitcom sound effect.) Here's a lovely picture of the bed that will not be mine. Time to find a new bed that won't quiet match our existing furniture. Last weekend, Chad and I got away to Dallas for the weekend as a collective birthday present to ourselves. Our birthdays are three weeks apart. It was so nice to have room service (champagne and chocolate covered strawberries upon arrival!) 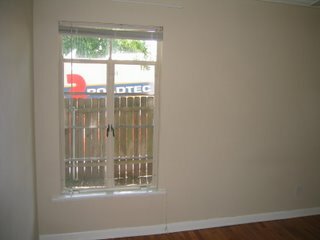 and maid service and already painted walls! We stayed at the Magnolia Hotel in downtown Dallas. We needed to be far enough away from the house that we weren't at all tempted to sneak back and do any housework. This weekend, it's back to the grind, back to the to-do list. 1. 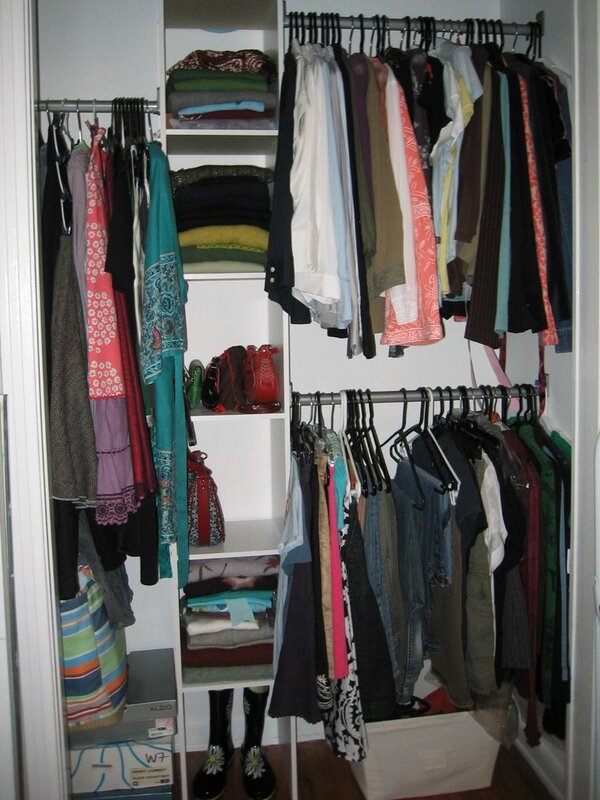 Install Chad's Closet Maid system and organize closet. 2. 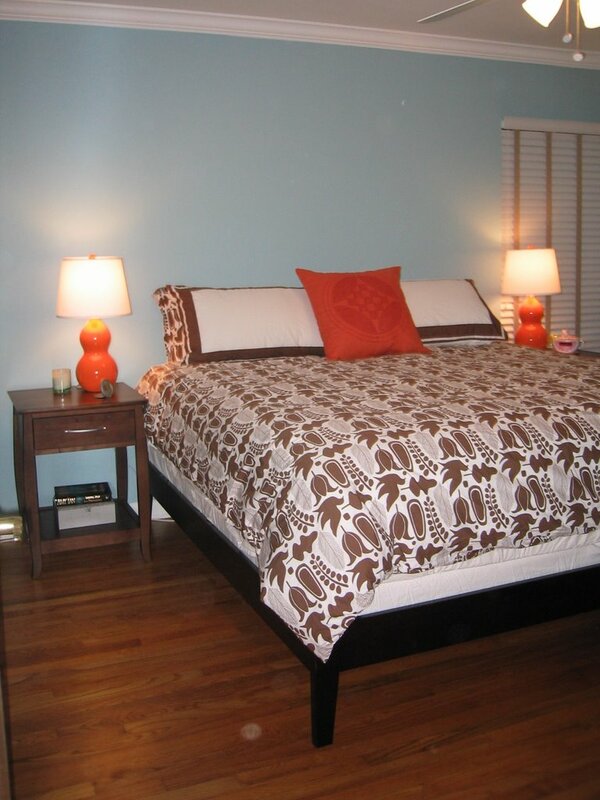 Clean the floor in the Master Bedroom. 3. Put dresser in Master Bedroom and finally unpack all the drawer items. 4. Plan grid for tin tile ceilings in the kitchen and bathroom. 5. 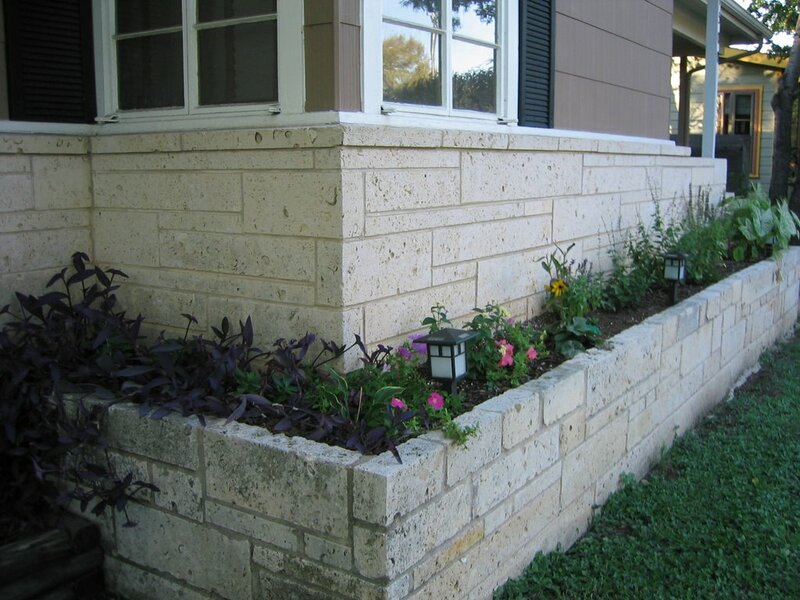 Buy materials for tile ceiling project and yard projects. 6. 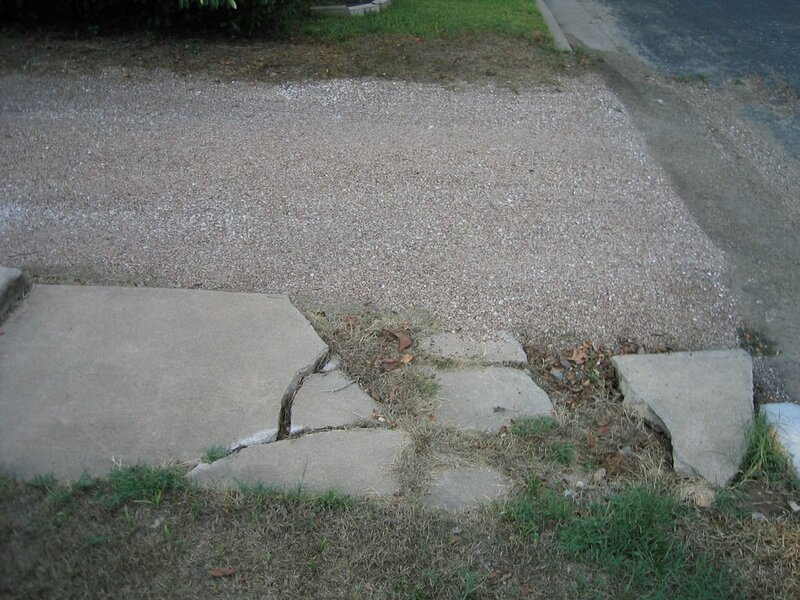 Sign and have notarized waiver for new driveway and walkway. 7. Sign and mail contract for deck installation. 8. Rent wood chipper for all the tree stumps we dug up and all the tree branches we picked up from the yard. Yeah... I don't know about #8, but we gotta do something with those branches and tree trunks / roots. 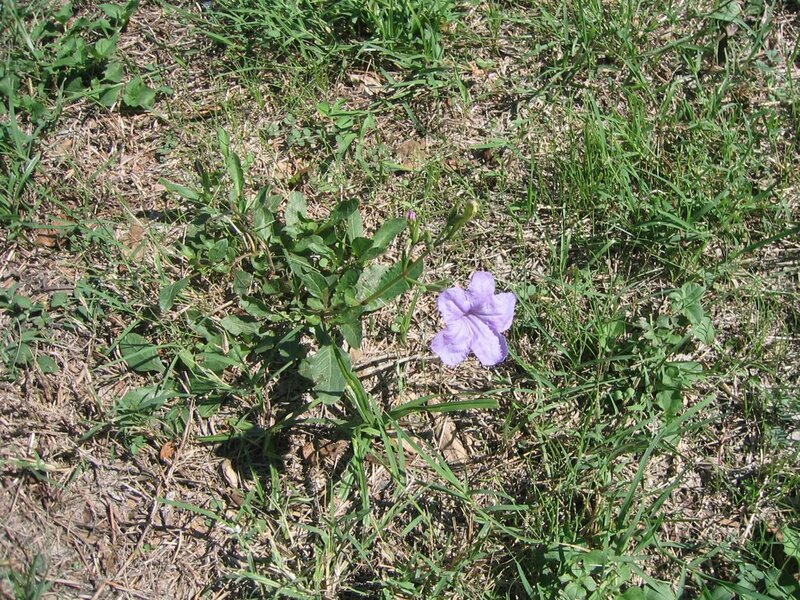 Is that purple flower a weed? I can't tell. 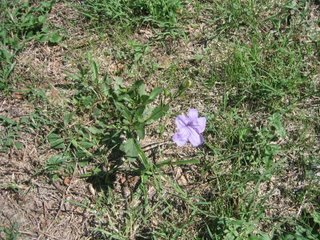 I've started mowing around them because they're kind of pretty. We have a Neuton mower. I love it. It's cordless, electric and very quiet. 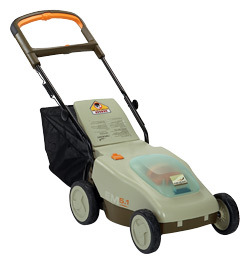 The City of Austin Clean Air program gave a generous rebate on these mowers. 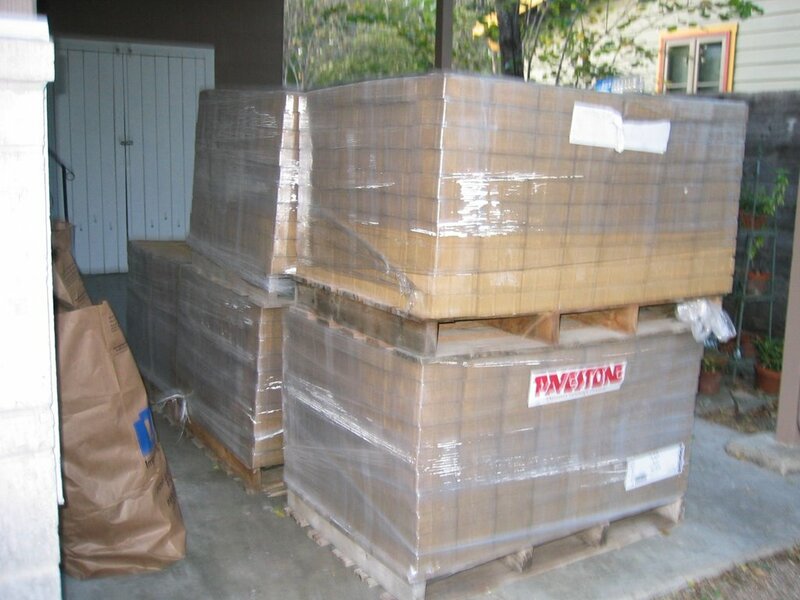 The UPS guy who delivered mine commented that he was delivering a lot of them. When Chad or I are out mowing, people stop and comment on our nice, quiet mower. Yes. I've become one of those people who talks incessantly about house projects, much like a new parent talks about their baby too much. Maybe it's better than coming off as a crazy cat lady by gushing about my fuzzy children all the time. Speaking of, Marigold and Kenji are so cute and funny! Marigold loves to go outside and sniff the sidewalk, but she's only allowed out with Chad or me. Enough about the fuzzy kids, here are some more before and after shots. Before: There is that icky yellow paint again! 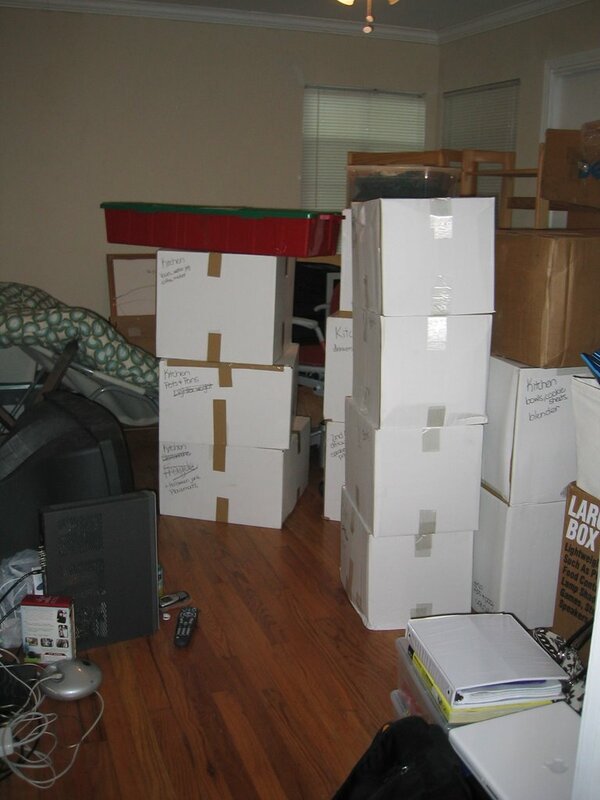 This is where boxes go for vacation! During: What a handsome painter! After: Check out the cozy kitty corner under the windows. 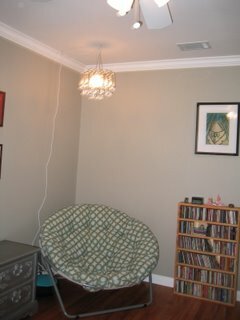 Here's my reading nook with the cheap chandelier. 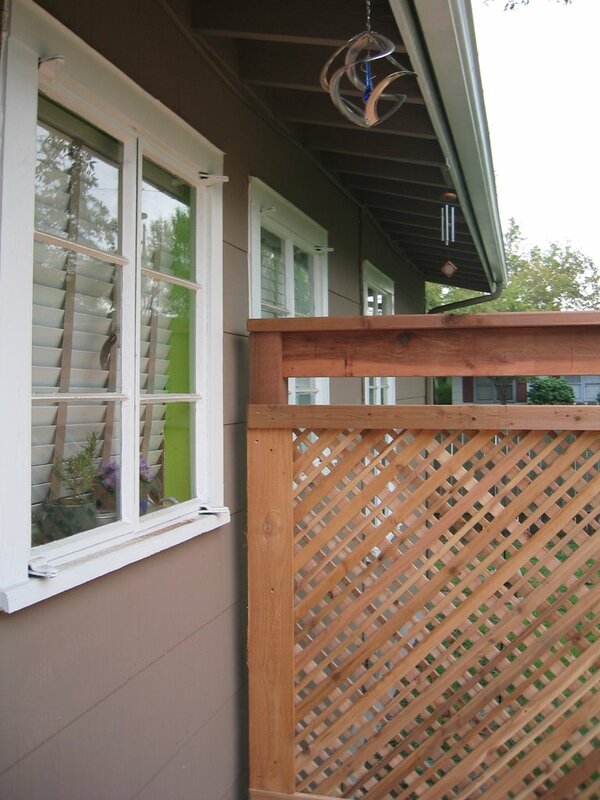 Before: What a fabulous view of the fence and truck driving down the street! 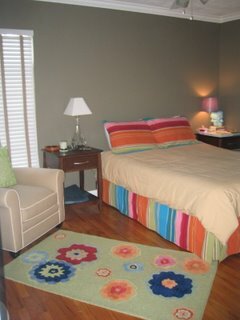 After: The completed, lovely guest room with a queen size bed just waiting for an occupant or two. Our guests will have the pleasure of helping us with the vast jungle that we hope will sometime be worthy of the term "yard." Here's my teeny-tiny closet. Chad helped me install this closet system. Miraculously, everything but my shoes fit. Maybe I can build another shed out in the yard for shoes. 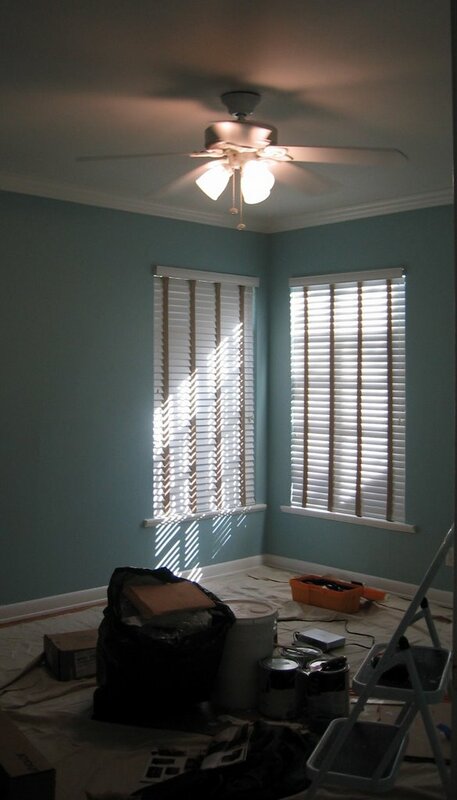 We finished the paint and installed the custom-order blinds from Lowe's. I love Lowe's. The employees are much more helpful than the people at Home Depot.